the circuit work perfectly with Arduino boar. But the problem is that when I use ATMEGA328p-PU on breadboard as explained in LINK, Relays are not working properly. Actually, relays connecting and disconnecting continuously when ATMEGA328p sends 1 to D1 pins of Relays. The point is when I de-attach the SWV, relays work properly. but if the SWV is connected it still is not working. I've checked the connection many times and they are correct. The problem is most likely EMI (electromagnetic interference) from the switching of the inductive load by the relays. The fact that you have your setup on a breadboard means that each and every pin of the ATMega328 is connected to a little antenna. That massively increases its susceptibility to falling prey to EMI. Add to that the fact that there is absolutely no decoupling of the power supply (thanks to Arduino producing shoddy worthless tutorials) makes the whole chip very fragile. When running with a real Arduino board you have decoupling on the power which helps to reduce induced power rail bounce which can cause the chip to fail. This means adding capacitors between each VCC pin and ground. At the bare minimum a 100nF capacitor on each VCC pin is needed. Additionally a 1nF capacitor can be beneficial. A 10µF capacitor should also be added on the breadboard's power rails to act as a board-level reservoir. 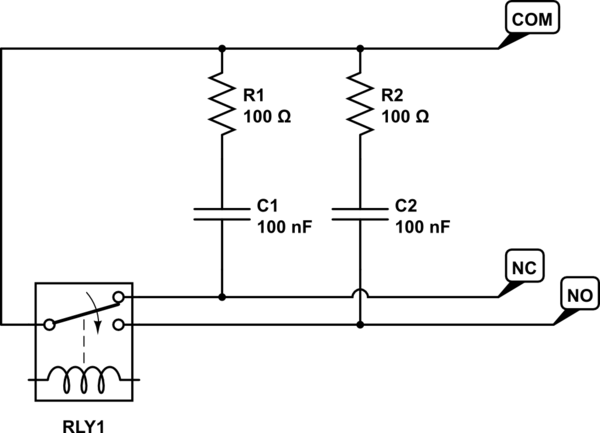 A snubber network, in its most simple form, is a resistor and capacitor in series. It is placed across the switching terminals of a device that is switching an inductive load to absorb the sudden spike of back-EMF from the collapsing magnetic field whenever the load is switched off. Note that the capacitors here should be rated for at least 400V since the voltages involved are quite high. An inductor can create large pulses of power when turned off and on such as in a relay or a solenoid. A flyback diode is usually added across inductors to suppress these pulses. Indeed if you look at the schematic of the Wemos Relay Board used in this project you see where D1 is used in just such a way. Unfortunately the voltage is being applied in both directions across the solenoid so a flyback diode can not be used directly across the solenoid. However, it may be possible to add a flyback diode before the relays where the voltage is not reversing. It is almost always better to mitigate electrical noise such as Electromagnetic Field (EMF) interference at its source. Hence the flyback diode. However, many combination logic and processor designers add decoupling capacitors as close as possible to the power terminal of each logic chip. This may be the reason a real Arduino board works while the bread board does not. Not the answer you're looking for? Browse other questions tagged arduino-uno atmega328 relay or ask your own question.